In my country of origin, Hungary, men should enter pubs and bars before their female companions, as opposed to holding the door for them. This is due to the assumption that pubs and bars can be dangerous and it would be impolite to let the lady enter first. I was looking at etiquette rules in other countries (especially the UK and the US) and haven't found anything of the sort. Thus the question is: do I hold the door and let the lady enter the pub/bar first, or should I go inside first? I have come across this etiquette for bars and restaurants in Germany, although it is not applied nearly as much as holding the door for example. it´s always a little intimidating entering a place full of unknown people. You would hold the door for the woman on the way out though. These are all rather optional today and if perceived well or not is highly dependent on the individual. I could also find a reference in the no. 1 German etiquette book, the Knigge which also mentions as reasoning the security-concerns of oldern days. In basically safe places, as pubs and bars in the US and the UK are supposed to be, the protecting behaviour towards the woman accompanying you does not make much sense anymore. I feel like the courtesy of holding a door outweights it. If the door opens outward, I open it, hold it and let the other person pass. If the door opens inward, I open it, go inside first and hold it for the other person. As you can see, the "going in first or not" depends only on what is the most comfortable way to open the door and hold it. As for the gender, if I'm with a man and I see that he wants to open the door for me, I'll let him do it; I perceive it as giving the two of us the chance of behaving according to the prevalent social rules, thus gaining "niceness points". If I'm with another woman, I'll generally hold the door for her. As a general rule, I expect the person that gets the door first to hold it for the other one(s), regardless of the gender. I can't speak for all of the US, but I hold the door for others - both men and women. The old rules of etiquette are changing. Men are no longer expected to walk on the side facing the street. Men no longer stand up when women enter or leave the room. Women and men now shake hands as equals - women no longer offer their hand with the palm down. These are just some examples. With respect to entering a business before a woman: I generally let my wife go in first. Why? I don't know; I suspect that it's because it's polite to let the other person with you go in first. She sometimes holds the door for me as well. I think that it would ruder to go up to the door, open it, go through, and let her deal with the door herself. If I do wind up going through a door before her, I hold it open - but I as a rule do that for the person following me irrespective of who that is. Here's what I suggest, especially if you're on a date: hold the door for her and let her in first. It doesn't have anything to do with her being frail or other feminist claptrap - holding the door for someone else just makes it easier for them and is the polite thing to do. I think it's considerate to open the door for someone else. Edit in response to OP's comment: With respect to going into a less safe place, I still would hold the door open for whoever I'm with. The reasoning for this is: I wouldn't take anyone to a place where there's a huge risk of something bad happening the moment you walk through the door. (Q: just how dangerous are bars in Hungary?) I wouldn't go there myself and certainly wouldn't expect anyone else to go there with me. Even if it's a really rough bar, it would take a few moments for anything to start and by that time I'd be inside anyways. I hold the door for my groups, male or female, but I make a special effort to do so for my female companions. Partly it is because I was trained to do so as a child. I view it as an act of courtesy and respect that sets me apart and distinguishes me from some other males. I've never met a woman who expected me to hold the door for her, and only very rarely met a woman who was insulted by the gesture. Most interpret it as a simple throwback gesture of respect. Older women usually appreciate it as a gesture of respect for their generation's customs. I live in Texas, though, and Southern Courtesy is a thing here. I also say 'Sir' and 'Ma'am' a lot more often than most. I pull the chair out for my date, and open the car door for her if I am able. I don't do these things because they are Ladies, but because I am a Gentleman, if that makes sense. In general I (a male) will hold the door open for anyone with me. However, my rules are complicated! If I am walking with a man, and the door opens towards me I will open it, and gesture for them to go through (Diagram 1 pt. A). Eye contact is important here. If they gesture back I will do as they indicate, and continue through - a back and forth in a doorway is not my idea of fun. 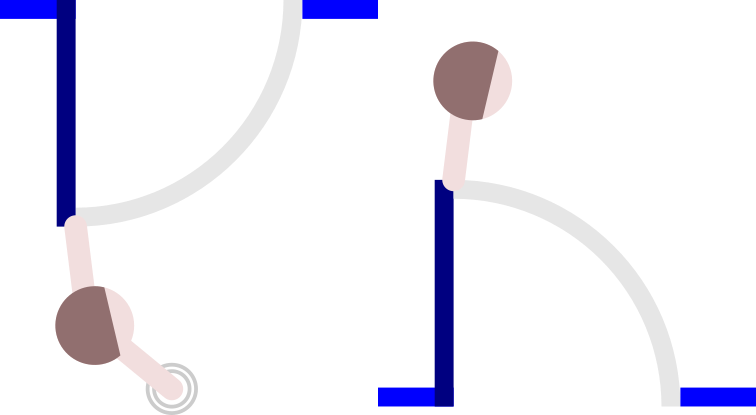 I will walk through a door which opens away from me then hold it for them (Diagram 1 pt. B). If I am walking through a door with a woman, I will hold the door open and gesture to them whichever way the door opens. (Diagram 2) Again, eye contact is a must. As with walking with a man, I will never get into a “gesture fight”. If I am walking with a group of just men, or a mixed group I will follow the same rules as I do when waking with one man. In the door towards me situation, I will walk through only when one member of the group gestures for me to. In the door away from me situation, I will walk away when the next person is holding the door (Diagram 3). If I am walking with a women-only group, I follow the same rules as with a single woman - I will still avoid getting into a “gesture fight”. If I do not know the gender of the individual, I will default to the rules for female companions. 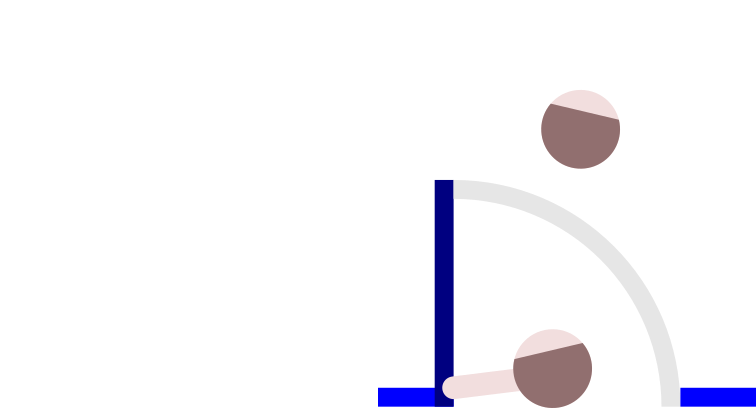 If the door is an automatic door with a button, the gender of the companion, the size of the group, and the direction of the door are irrelevant. 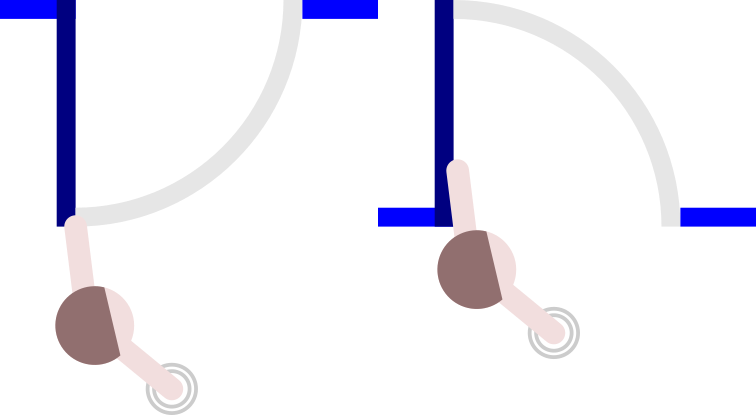 I will press the button, then follow the same sequence as with one woman (Diagram 2 pt. A - without holding the door of course), or mixed group. If there is a person not waking with me, but just behind and I know they are walking through the same door, I will hold it if they are less than 4 seconds behind. Whoever approaches the door first should just walk through and hold the door behind them, regardless of anybody's gender. When somebody approaches the door, holds it open without entering, waits for me to walk through, and then follows behind me, I find it slightly awkward because it takes me by surprise and I always hesitate momentarily. French polite way would be to hold the door for anybody, not just females. Of course, it's even more important to do so for females, because courtesy. But personally I do it for about everybody, especially females/elders/disabled people and people I'm walking alongside with. It varies from person to person, but generally in the US, it's only a big deal if you make it a big deal. When I'm out with my fiancee, sometimes I'll get the door for her. And sometimes if she's in front, she'll get the door for me. It's just basic politeness, and it's appreciated, but not anything to make a big deal out of or attach special significance to. It does not matter who you're holding the door for, actually. It's okay to hold the door for anybody who got some items in both hands and can't open the door, or the person who is not able to open the door due to the strength they lack. The reason why it became a norm to hold the door for ladies, because they usually carry a bag in one hand and a baby in other or they have complicated clothing etc. In the end, it is okay to hold the door for anyone. First of all, LinuxBlanket's comment is what I do regardless of my companion's gender. In addition to that, holding doors exclusively for women is seen as somewhat backward in many areas. However, some places still treat it as normal---but even there, you will very rarely be censured for noncompliance. It seems they understand the habit is falling by the wayside. Some women still like the deference in a romantic context, but I don't believe you are asking about that situation. If there is sufficient space behind/around the door that you can hold it without blocking your companion, you hold the door and let them pass. If you are part of or followed by a long line of people entering, you pass through and hold the door open behind you. Both of these are regardless of whether or not your companion is a personal partner, work colleague, etc. and regardless of gender, if you reach the door first. In areas where dangerous venues tend to be, one might be less safe being the last one out on the street (where one can be more easily snatched up or assaulted by someone who's got a lot more room to run), so even that safety argument seems to go more in favor of letting the lady enter first. In the UK/US, pubs and bars tend not to be such dangerous places. If you have reason to believe the one you are about to enter is dangerous enough that this would matter, the modern common solution is to not enter with a delicate companion, but to choose a different venue for your time. There are, at least in theory, enough relatively safe places in those countries that men can take their female partners to venues where they expect their partner to have a good experience, or at least not a bad one. Especially in inclement weather, there is a stronger etiquette argument for getting your partner inside first. If this is an established pattern, it also helps minimize the time the door is held open, to keep the elements out from those already inside. I don't necessarily mean verbally asking a question. As you hold the door, look her in the eye and see what she wants. Some women like having the door held. Some would prefer you just go through, and not slow down the pace of travel much. Although, she will generally appreciate an actin such as pushing the just slightly before she arrives, so that hopefully she doesn't need to touch it at all, and if so then it's just a slight convenient bump rather than a more significant effort on her part. Some women may change their desires, and so checking repeatedly and responding to their answer (which, again, may include some hand gesturing or simply facial expressions or eyelid movements) can be the method to achieve the greatest possible successes. Don't assume that one rule works best for all women, and it can even be true that one approach won't consistently be the preference of even just one woman. Many answers say what they find polite in US/UK contexts, with helpful reasoning. However, most do not directly address which form of courtesy you ought to use in this situation. Not the answer you're looking for? Browse other questions tagged united-states united-kingdom etiquette or ask your own question. Under what circumstances is it okay to not hold a door open? What is the etiquette for asking a dog owner before I pet their dog? The etiquette of holding foot traffic up to take a photo in public? What's the etiquette for posting a webcomic on your site? What is the proper etiquette for making ones presence known non-verbally?